The name Jimmy Lee Lindsey Jr. might not sound familiar straight away, but the name Jay Reatard on the other hand rings a bell or two for garage punk rockers. The hyperactive and prolific cult punk - who has also performed in Finland - became famous for his �€�I couldn�€�t care less�€� attitude and catchy rock tunes. Reatard died of cocaine poisoning in January 2010, when he was only 29 years old. 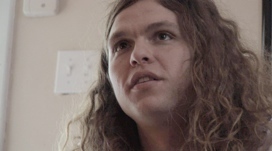 Alex Hammond and Ian Markiewicz followed Reatard�€�s last months before his tragic death - the interviews done at that time form the framework for the film Better Than Something. Even though Better Than Something has been put together after Jay Reatard�€�s death, don�€�t expect to see a sad, reminiscent story. The sorrow for his sudden death is naturally there, but in the centre there is a story about young man fighting his demons (poverty, alienation, problems with the media) and searching for a normal and regular life. Before his death, Reatard was on his way towards a more intact life but the lures of self-annihilation were too strong to overcome and in the end took the life of the cult hero. Better Than Something isn�€�t as gloomy and serious a film as Reatard�€�s story might lead you to believe. Riding along with the rock star, who is living his life to the fullest, is a blast - Reatard finds himself in peculiar situations thanks to his attitude, and his stories are hilarious too! What is more, the concert footage in the film is explosive! Better Than Something is honest, fierce and touching like its subject, and it is a powerful portrait of a complex man who made his music with all his might.